Every great menu needs a bread course. 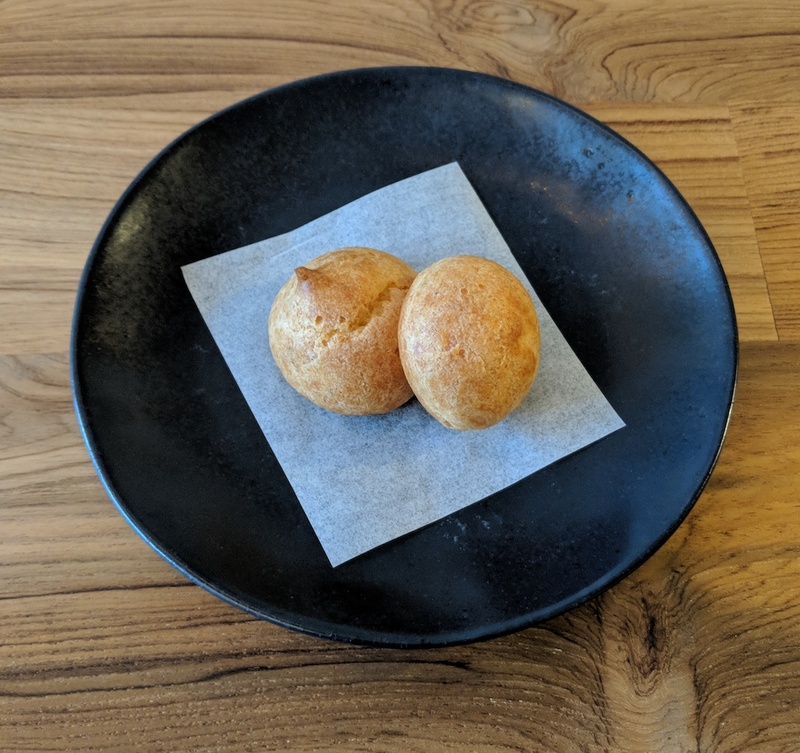 For mine I decided to lift an idea from the French Laundry in Napa and make gougères, aka the formal French name for cheese puffs. On their own, gougères are nothing more than choux pastry dough (flour, butter, eggs, and water only, relying on steam to rise) with tons of cheese added; gruyere is traditional but I'm using Manchego here. Cheesy gougères are delicious enough, but to really push things overboard these are filled with a modern take on a mornay - a classic French melted cheese sauce, also made with lots of Manchego. For interest, I used a 50:50 mix of two different Manchego varieties, one aged 3 months and the other 6 months. When you bite into one of these, the gougère dough immediately collapses and gives way to warm cheese sauce. It's a pretty freakin' amazing bread course. Prepare the gougère dough (up to 1mo in advance): Combine the water, butter, salt, and some pepper in a pot over medium heat. Bring to simmer and let the butter melt; stir to combine. Remove from the heat. Off the heat, stir in all of the flour for ~1.5m until a paste-like consistency is reached. Place back over medium heat and stir rapidly for 1m until the dough pulls away from the sides of the pot. Rest for 30s to release moisture. Beat in the eggs one at a time. Fold in the cheese. Transfer to a piping bag and pipe evenly-spaced mounds roughly 1 Tbsp in size onto a tray lined with a silpat. Wrap tightly with plastic wrap and freeze for up to 1mo. Prepare the Manchego mornay (up to 8h in advance): Combine the milk, sodium salts, and cheese in a vacuum bag without sealing. Cook sous vide at 167F for 15-20m. Blend thoroughly. Adjust seasoning. Transfer to a piping bag fitted with a fine tip. Chill. Bake the gougères (up to 5h in advance): Preheat the oven to 375F. Bake the gougères from frozen for 25-30m. Lower the temp to 325F and bake an additional ~10m, or until golden brown and still a bit moist. If baking in advance, remove and let cool; reserve in a container covered with a towel. To serve: Gently warm the mornay if it is not pliable enough to pipe. Pipe some mornay into each gougère, ideally from the bottom so the hole is not visible. Heat in a 300F oven for 10m to serve.